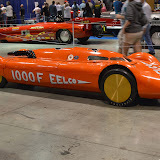 This year, the Grand National Show was celebrating 100 years of Bonneville. First time I have gone to the show. Lots of cool cars. History of chasing speed. The show goes though Sunday. Friday was a great day to go. Less crowds, and we had plenty of time to meander around the cars. Check out the pictures and album.